May 24, 2013 By This post may contain affiliate links. 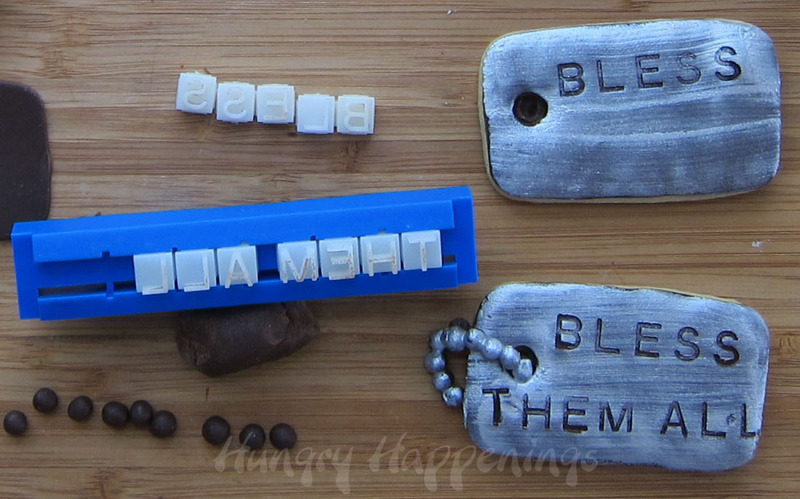 For Memorial Day make these Dog Tag Cookies and personalize them in Honor of those who have served our country! 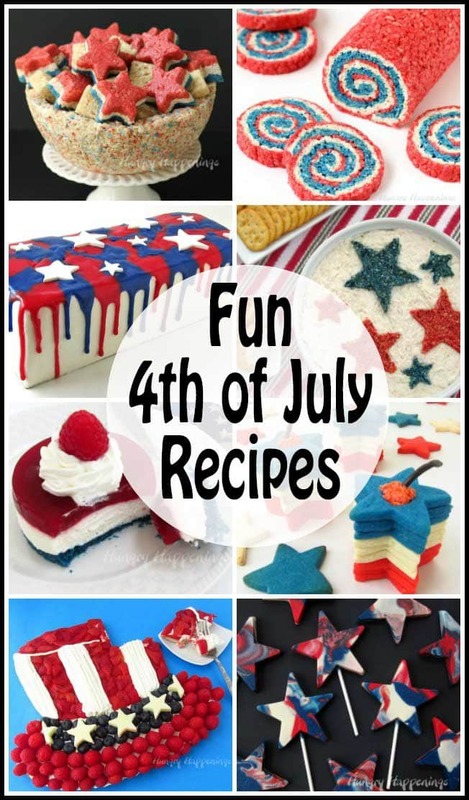 These yummy treats are perfect for any patriotic holiday and are a great centerpiece. On Monday we will honor those brave men and women who died while serving in the United States Armed Forces. I have many relatives and friends, including my husband, who served our country in uniform, but am so blessed than none perished during their stint in the service. Memorial Day has always been a celebration about having the day off of school or work for me, but this year, I’m more reflective, after having lost two family members this month, and am more aware of the sorrow many of you feel on this occasion. 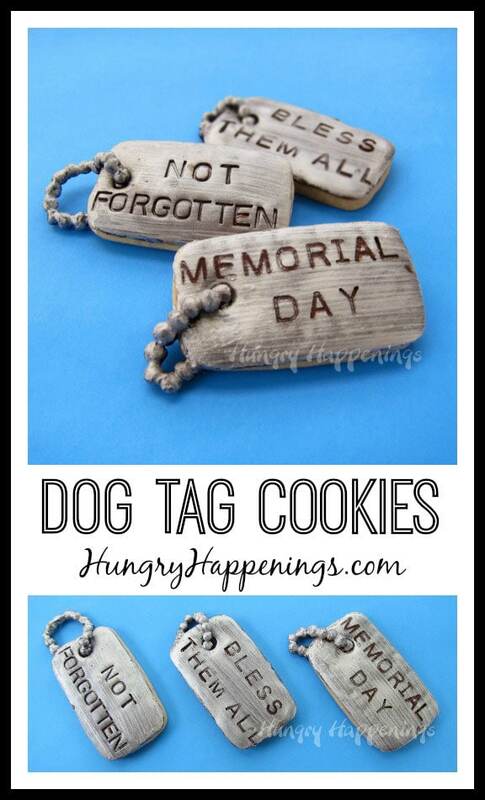 Instead of focusing on making picnic food this year, I decided to create dog tag cookies that can be personalized to reflect your personal experience. 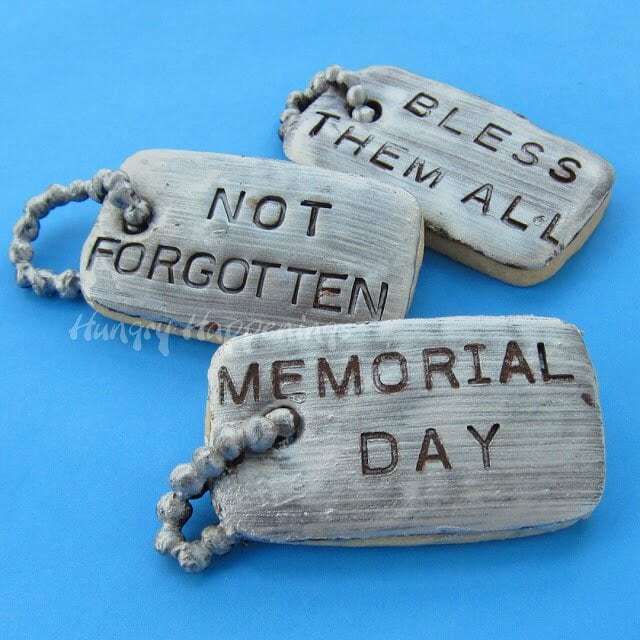 Each dog tag cookie that I made, commemorates all of the fallen soldiers, but you can personalize them in honor of a family member or friend who died serving our country for Memorial day or for a member of the military for Veteran’s Day. 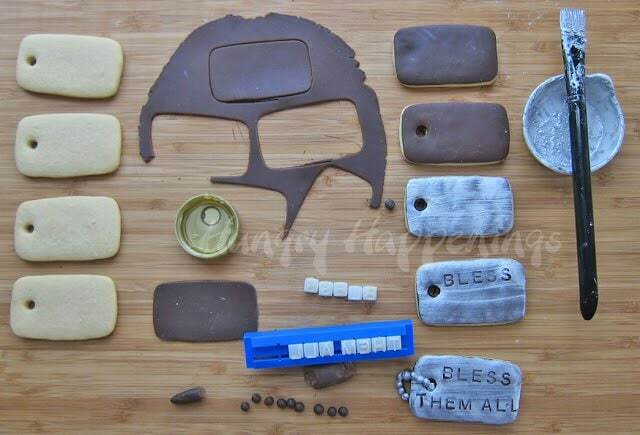 If using a cookie cutter making kit, create your own dog tag shaped cookie cutter. 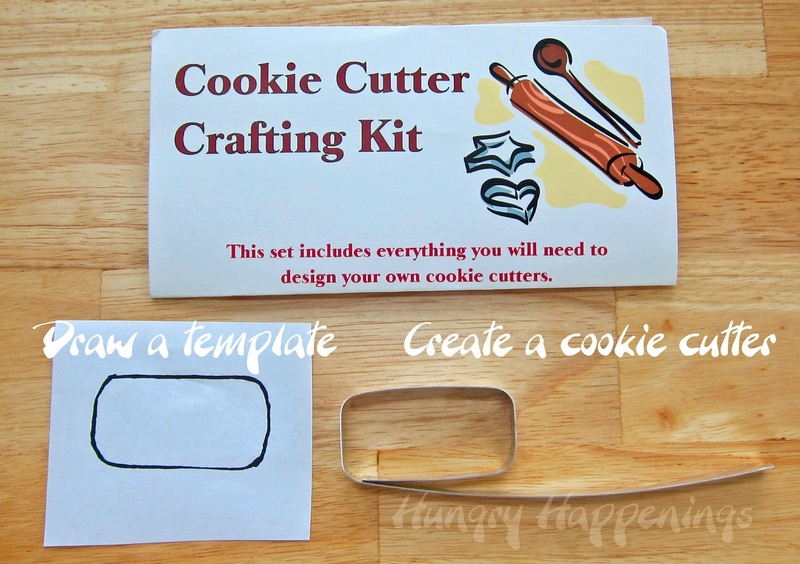 If not, just draw a template, cut out around it and use it and a knife to cut out your cookies and modeling chocolate. I love these cookie cutter crafting kits and have used mine so often that I’ve had to order refill aluminum strips several times. There are directions for use in the kit. NOTE: Before you cut your template, be sure the cookies will be large enough for your personalization. If using letter stamps set out the longest word you plan to use and make sure it fits. Flour your cutting board, roll out dough to desired thickness, cut out cookies using dog tag cookie cutter or knife. Use a small round plunger cutter, a straw, or a round pastry tip to cut out one hole at one end of each dog tag cookie. Bake according to recipe instructions. I baked mine at 350 for about 10 minutes. Roll out dark modeling chocolate. * Cut using dog tag cutter or knife and template. Brush cookies lightly with corn syrup or frosting, attach modeling chocolate, press down to secure and cut out hole using plunger cutter. * To easily roll out modeling chocolate, place it inside a large zip top bag, and roll until thin. Cut out three sides of the zip top bag and carefully peel off modeling chocolate. Pour 1 teaspoon vodka or vanilla extract in a small bowl, add about 1/4 teaspoon silver luster dust, and stir. Add more dust or liquid as needed until you have a nice smooth paste. Brush luster dust over cookies. Allow to dry. Personalize cookies by pressing letter stamps into the modeling chocolate or by writing with food coloring markers. Pinch off tiny pieces of dark modeling chocolate and roll into balls for the chain. Roll enough to create all your chains. Attach the tiny balls to each other and to the dog tag cookies using melted chocolate. Allow to dry. Brush over the chains with the wet luster dust. Store in an airtight container for up to a week. The chains will be very fragile, so handle with care. you are constantly innovating and creating such fantastic and unusual things. amazing. i lost my WWII dad before becoming engaged. i pinned his dog tags inside my wedding gown so a part of him could walk me down the aisle. dog tags are such a huge part of one's military service. thank you for this unique creation. it is truly inspired. Your story really touched my heart. You found an amazing way to honor your father and have him walk beside you on such an important day. These dog tags were created with someone like you in mind and I'm glad you like them. I used melted chocolate as glue to hold the pieces of the chain together and to attach it to the cookie. I've picked these up and moved them around several times to take pictures and the chains are still intact. I will admit that making the chains took quite a bit of time, so I wont be putting chains on all my cookies. What a cool idea, perfect memorial day treat! Out of curiosity, what letter stamper are you using? I've been wanting to find one, but haven't had much luck searching. This is such a great idea–amazed at your creativity, as always. 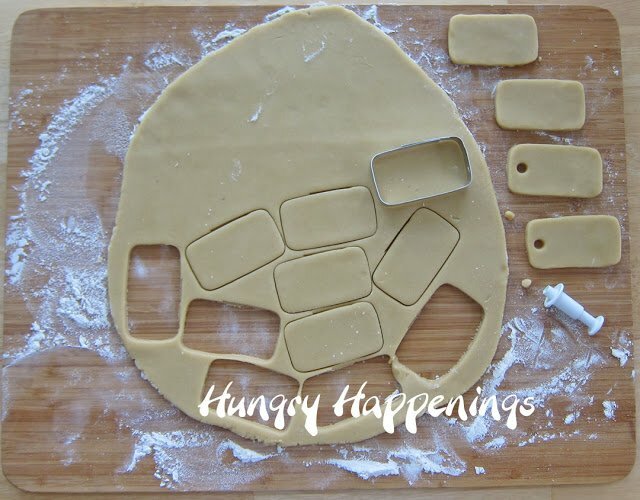 Who knew you could make your own cookie cutter?!?! These are fantastic (as usual) and I bet the taste as good as they look! I've made my own cutters to create so many things for customers, they are great. I'll try to do a detailed tutorial sometime soon. You are so inventive. I love it! First of all – my sincere sympathy for having lost 2 family members in the last month. Such heartbreak to lose one, but 2 so close together is such a tragedy for a family. Carla wearing her dad's dog tags pinned to her wedding dress so he could, in essence, walk her down the aisle, was heartwarming. Her family will remember that forever. Other wedding day details will fade over the years, but not that one. 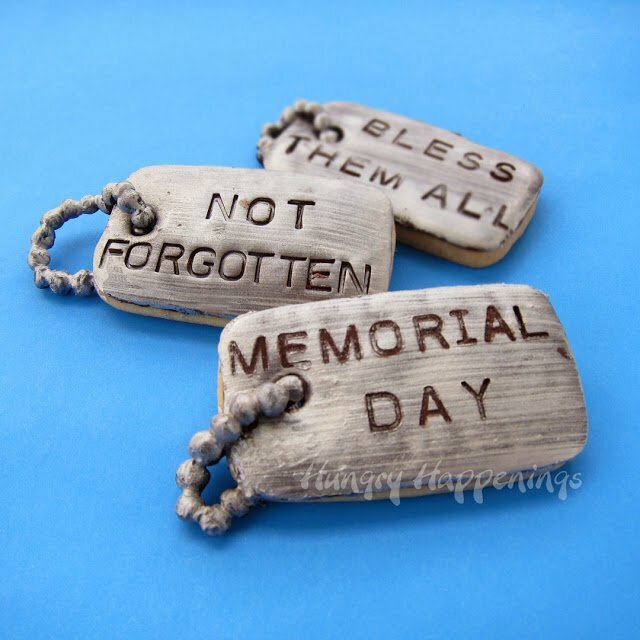 Along that same vein, at weddings, landmark birthdays and funerals when photos are normally displayed, these dog tag cookies could be laid right next to the picture frames for a unique way to memorialize one's time in the service. QUESTION: When using the clay embossing letters, how is it that the lettering is darker than the outer part of the modeling chocolate? With the dog tags brushed in silver – that I understand because the letter will push through the silver & into the chocolate, but on your fudge rocks – did you color in the lettering? QUESTION: Clay embossing set – 1 set is $20 and the 2 others are $10 (same company). What is the feature of the $20 set that would entice customers to buy it vs the $10 set? They all looked to be the same type face (perhaps Victorian?). QUESTION: What is the height of the letters? You know who this is from – your follower with all the questions 🙂 🙂 Hey – interest in your ideas means you've stimulated us to think and that's a good thing. I'm glad you are interested enough to ask questions. Keep 'em comin! When I pushed the letters into these cookies, you are seeing the dark modeling chocolate. I liked that effect. At first I used white modeling chocolate, but the tags were too light and I didn't see the lettering very well. When I press the letters into the cookies 'n cream fudge rocks you are just seeing a shadow. I did not color them at all, but the letters really show up well. Two of the embossing sets only have letters. The more expensive set also has some metal cutters and some metal stamps. I like the style of letters in this set the best, they are what I used for this project. The letters are about 1/4" in height. They are pretty small, but smaller letters would have been even better for this project. It was a challenge to get the long words onto these cookies. Thanks for inquiring and have a nice Memorial Day weekend. I am sorry for your losses and hope that you have many family and friends to help you through. Carla's wedding story was so touching and it's wonderful that with this post you could bring back a touching moment for her. These cookies are amazing and I will be making these next year for Memorial Day as part of my BBQ get together. It will be a touching reminder of what the day truly means. Thank you for your kinds words, Tiffany. I think it is wonderful to be able to create something that touches people's hearts and brings up memories. That has always been one of the most rewarding aspects of baking and candy making. I hope you had a nice Memorial Day. Nicely done, the silver luster on the modeling chocolate looks really effective. Thanks, Linda. I was amazed when I looked at the pictures, at just how real these look. I love luster dust and am using it again today! Simply amazed by tour talent. Using a toothpick could work, but it will cut through the modeling chocolate by kind of tearing it so you'll end up with scraggly edges. I really do suggest using the stamps. Once you get the words set up in the plastic holders you don't have to change them and it's so easy to just press them onto the modeling chocolate. You can also use rubber stamps, if you can find anything appropriate. How did I miss these?? Such a great idea Beth! !